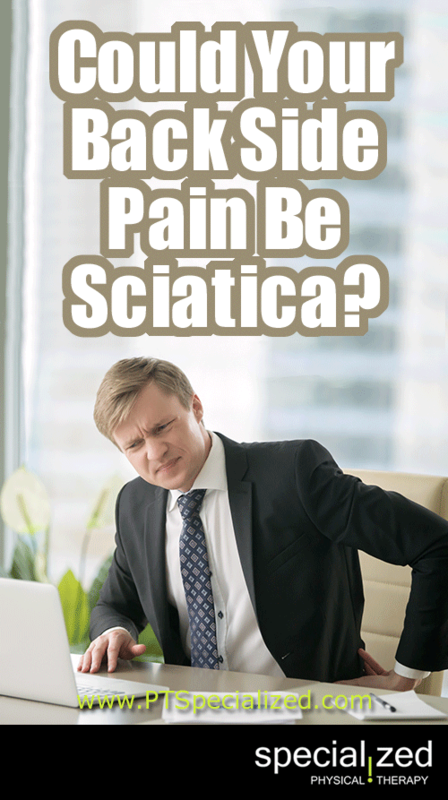 Could Your Back Side Pain Be Sciatica? Sciatica. It’s literally a pain in the rear. It makes doing anything painful; sitting, standing, walking. It isn’t a pain in the back. The sciatic nerve may be at the end of the spine, but it causes sharp pain in the buttock and leg. All you want is relief. Physical therapy can get it for you. A common expression we hear from new patients coming to physical therapy is, “my sciatica is acting up.” This usually means a person’s back pain has flared up and is causing a pain that travels down into their leg. Typically, this pain is located in the posterior hip (buttocks) and along the back or side of the upper leg. In many cases, these patients have correctly identified that their back is aggravated, but they have incorrectly implicated the sciatic nerve as the source of the pain. Patients describe this “sciatic” pain as a deep, dull, aching pain in the gluteal region or along the side of the thigh, but when the pain in that area has a dull, gnawing and aching character, it typically is coming from the deeper gluteal muscles and NOT the sciatic nerve. If there was an impingement or injury along the sciatic nerve, the pain would be sharp and electric in nature. We call that radicular pain. However, the dull aching pain that is a common complaint for people with back pain is not a radicular pain, but a somatic referral pain. Somatic referral pain refers to any soft tissue in our body that is stressed and representing its pain pattern. In this case, the somatic pain is coming from our deeper gluteal muscles, the gluteus medius and gluteus minimus. These muscles’ referral patterns lie along the buttock and posterior thigh, which is why their pain is often misinterpreted as a sciatic nerve pain. These muscles are typically weaker in nature, and when a back aggravation occurs, these weaker muscles are employed to guard and protect the lower back. This event leads these weaker muscles to overworking themselves and developing their own pain pattern. When a person’s “sciatica” is not “sciatica” at all, but actually a referral pain from an overused gluteal muscle, physical therapists are able to use an advanced manual technique, dry needling, to effectively stop the pain. Dry needling utilizes a thin filament needle to deactivate overused muscles and to allow the muscle to reset itself. It is a powerful tool that often makes immediate changes in patient’s pain symptoms, and when utilized in conjunction with specific corrective exercises, can have a long lasting resolution to a person’s pain. The therapists at Specialized Physical Therapy are trained in the advanced technique of dry needling. Scheduling a consult with one of our therapists can help you determine if your “sciatica” is actually coming from an aggravated gluteal muscle that can be effectively resolved with dry needling. Not all pains in the buttocks are sciatica. If you aren’t sure come in and have it looked at to find out. Whether it is or isn’t sciatica, physical therapy can help you. And after all, isn’t that what you want?